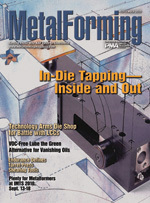 MetalForming has been the leading source of metalforming industry news and information for more than 40 years. Leveraging media exposure with a recognized authority should be a crucial component to your marketing strategy. Reprint products allow you to capitalize on your coverage in MetalForming with several highly customizable options. Produced on high-quality paper in quantities ranging from 500 to 20,000, standard reprints can feature the original editorial along with your own advertisements, company profile and contact information, and can be graphically enhanced with text highlights, quote boxes and other visual effects. An expansive promotional tool for market leaders, reprint compilations combine multiple MetalForming features, past and present, that have highlighted your company and can include your own advertisements, whitepapers, product guides or company profile, among other options. Compilations can be as small as 2 pages or as large as 24. Launch a direct-mail campaign that is boosted by the MetalForming brand. Reprint postcards are ideal for short articles that announce the release of a new product, a corporate expansion or the receiving of an industry award, among other scenarios. Blow-up posters make for impressive image-builders in the corporate lobby, conference room, shop floor or executive office. Plaques make for impressive image-builders in the corporate lobby, conference room, shop floor or executive office. There is a wide range of possibilities when specifying your custom reprint. You can add your company logo or a quote from the article to the cover, highlight the most relevant text or insert your advertisement. MetalForming´s graphics professionals provide design services at no extra charge.